‘This is not about saying nurses are too posh to wash,’ the Royal College of Nursing’s adviser on infection prevention and control, Rose Gallagher, told the magazine. Tracey Cooper, president of the Infection Prevention Society, said: ‘Nurses are the guardians of the standards of their wards. ‘Cleaning has always been an integral part of what nurses do. 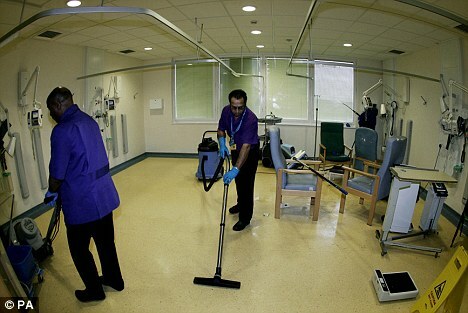 Andrew Jones, president of the Association of Healthcare Cleaning Professionals, said it was ‘inevitable’ that nurses would end up doing some cleaning of patient areas during out-of-hour periods.